I might have been predisposed to write from an early age. My mother (who is on my mind today) gave me a blank book to write a story in at the age of…seven, perhaps? Eight? She read to me, shared not only books she liked but books she thought I would like, and helped me explore my interests in whatever direction they branched. She was not a fan of science fiction and fantasy, but when I showed an interest in it, she helped me find good books–“The Dark Is Rising” series came from her, and Narnia, and Prydain–and then let me go off on my own. I was fortunate enough to be exposed to creativity and writing at an early age, and in high school, I had a couple friends who shared at least a love of F/SF books with me. After college, I tried to recover that sense of community in writing again. It took a while, but in the late 90s I met some other writers online, including Jeff Eddy, with whom I founded Sofawolf Press. And in the mid-2000s, in the Bay Area, I met a small group of writers who have really helped me rediscover that community. I think that writing, in a way, is my continuing quest to maintain that connection with other people, to rediscover the sense of wonder I had growing up when I read those books and shared them with friends. That I’ve been able to forge connections and close friendships via my writing is really a tribute to the foundation laid early on in my life, with the very first friend I shared stories with. Lots of my friends have children now, and because I have a lot of awesome friends, I am seeing a lot of children having those same kinds of foundations laid. It makes me happy, and hopeful, and excited for the future. I believe that if, at the end, according to our abilities, we have done something to make others a little happier, and something to make ourselves a little happier, that is about the best we can do. To make others less happy is a crime. To make ourselves unhappy is where all crime starts. 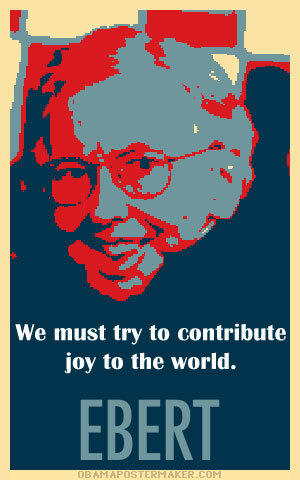 We must try to contribute joy to the world. That is true no matter what our problems, our health, our circumstances. We must try. I didn’t always know this and am happy I lived long enough to find it out. I have a Shepard Fairey-style picture of Faulkner over my desk with the (paraphrased) quotation “Don’t bother being better than others. Be better than yourself.” I wanted to create one of Ebert with those words on it, and so I took to the Internet to find a suitable picture. There’s something very interesting about those pictures of Ebert. Following the cancer which took his voice and lower jaw, his face looks very different, of course. Many people might have shied away from the camera, but he did not, so there are a number of “before” and “after” pictures that come up in a Google Image search. The “before” pictures are closer to how I remember him, and in many of these pictures (including the one that heads that Salon article), Ebert is serious, thoughtful, contemplative. In every one of the “after” pictures I could find, his face is lit up with a bright, happy smile. This smile, in a man who loved to talk and had had that taken from him, is the perfect image to go with the words he wrote. Even in his last column, “A Leave of Presence,” he looks forward with optimism and determination–with joy. So I made the below image, using obamapostermaker.com. It’s from a photo that came up in a couple places online and I freely admit I have no idea who owns the copyright; I found it on frisky.com, where they had tagged it, but I found the same image elsewhere without the tag. In any case, I’m not making money off it–if you like the image, feel free to copy it. Thanks, Mr. Ebert, for all the joy you brought to this world.